You’ll have to become the captain of a ship to sail the ocean blue in this unique slots game. Click here to play! Successfully navigate the seven seas and you’ll find yourself hauling in a hefty fortune. The top payout on this seaworthy game is the Crazy Slots logo. Spin two to five of them across an active payline to gain up to 10,000 times your line bet. You’ll surely see plenty of colorful fish while out on the water. These little guys will bring in up to 1500 times your line bet if you spin two to five of them across an active payline. Next up is the anchor. This golden symbol will fetch up to 500 times your line bet. Be sure to spin in helms, lifesavers, lollypops, and sting rays, as they will all payout pretty handsomely. Do you have what it takes to live out at sea? 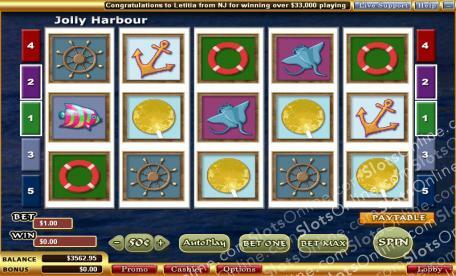 Find out by spinning the reels on this fun slot game, and you might just return to shore with plenty of big money wins.